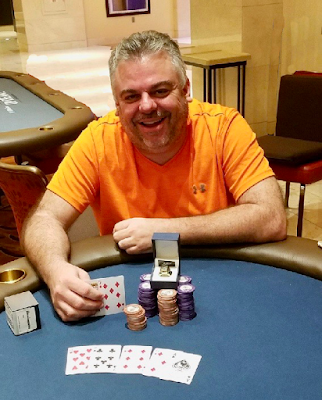 Short-stacked to begin the final table, Manteca's Steve Lustig rallied back to claim the $365 HORSE title - Event 7 in #TVWSOPCircuit Series - for a $6,615 cash and a WSOP Circuit ring. Lustig began his comeback by doubling through the Aces of Scott Cooper in Stud, found another double quickly thereafter, and finished off his run by defeating William Higgins heads-up. Among the familiar faces who came and did not final table was 2015 WSOP $10,000 HORSE bracelet winner Andrew Barber who missed the money by two places. Here are the final results from last night's Ring Event.